This article describes how to allocate your Observe module user licence allocation. Click on 'Manage Users' and then select 'Edit User'and enable the module by ticking the Observe box and register your new user. Add a new user by clicking the 'New User' icon. To remove or add access to this module at a later date simply click on the 'Edit User' icon and tick or untick the Observe module tick box. You can continue to do this with all your users until you have used up your licence allocation. When you have utilised your licence allocation a message will appear to say 'You have reached your maximum user count for this module'. 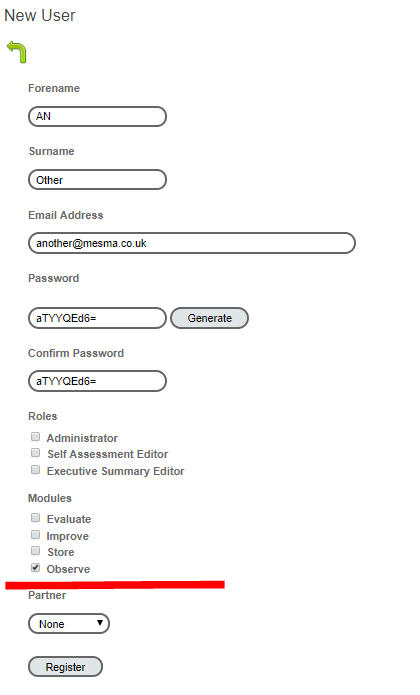 In this instance please contact hello@mesma.co.uk to organise an upgrade on your licences. If you have any further question please do not hesitate to use your online chat.